They can be seen alone or together in the “La Pieuvre” orchestra and also in various formations. Original guitar duet, this is more often succession than simultaneity. After several performances based on scripted improvisation, they decided to extend their approach by experimenting with more types of constraints. They developed an interactive device that blurs listening, connecting their instruments to sound treatment of one form or another. 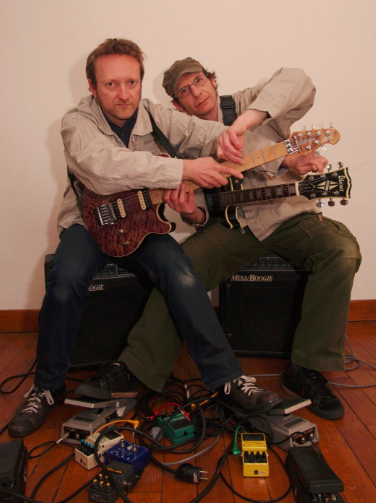 In this new configuration they find a form of instability appropriate to free improvisation via short circuits, branch-circuits, misbehaviour, incursions, diversion and other hazards, thus thwarting notions of solo / duet.